A 520g individual of the Allende meteorite shower. Credit: H. Raab / Wikipedia. Cosmochemists have solved a long standing mystery in the formation of the solar system: Oxygen, the most abundant element in Earth's crust, follows a strange, anomalous pattern in the oldest, most pristine rocks, one that must result from a different chemical process than the well-understood reactions that form minerals containing oxygen on Earth. "Whatever the source of the anomaly must be a major process in the formation of the solar system, but it has remained a matter of contention," said Mark Thiemens, dean of the University of California, San Diego's division of physical sciences and professor of chemistry. "Our experiments essentially recreate the early solar system in that they take gas phase molecules and make a solid, a silicate that is essentially the building block of planets." By re-creating conditions in the solar nebula, the swirl of gas that coalesced to form our star, the planets and the remnant rocky debris that circles the Sun as asteroids, the researchers demonstrated that a simple chemical reaction, governed by known physical principles, can generate silicate dust with oxygen anomalies that match those found in the oldest rocks in the solar system, they report in the early online edition of Science October 24. Scientists first noted the discrepancy forty years ago in a stony meteorite that exploded over Pueblito de Allende, Mexico, and it has been confirmed in other meteorites as well. 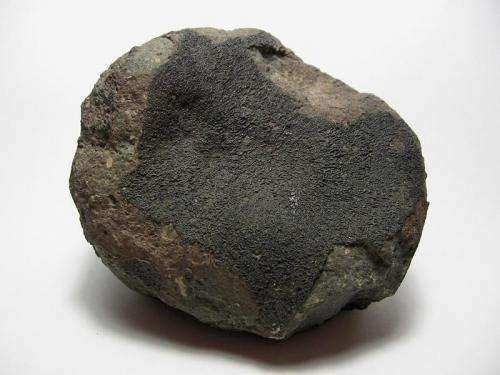 These stony meteorites, asteroids that fell to Earth, are some of the oldest objects in the solar system, believed to have formed nearly 4.6 billion years ago with the solar nebula's first million years. The mix between oxygen-16, the most abundant form with one neutron for each proton, and variants with an extra neutron or two, is strikingly different from that seen in terrestrial rocks from Earth, its moon and Mars. "Oxygen isotopes in meteorites are hugely different from those of the terrestrial planets," said Subrata Chakraborty, a project scientist in chemistry at UC San Diego and the lead author of the report. "With oxygen being the third most abundant element in the universe and one of the major rock forming elements, this variation among different solar system bodies is a puzzle that must be solved to understand how the solar system formed and evolved,"
Oxygen isotopes usually sort out according to mass: oxygen-17, with just one extra neutron, is incorporated into molecules half as often as oxygen-18, with two extra neutrons. In these stony meteorites though, the two heavier oxygen isotopes show up in equal proportions. The rates at which they are incorporated into minerals forming these earliest rocks was independent of their masses. Thiemens and John Heidenreich demonstrated such mass-independent fractionation of oxygen isotopes in the formation of ozone thirty years ago, but the mechanism for a similar process in forming the solid building blocks of rocks has not be demonstrated experimentally before now. Indeed, several competing ideas have been put forth as potential explanations for the anomaly. Some have suggested that the mix of oxygen isotopes was different back when the earliest solid matter in the solar system formed, perhaps enriched by matter blasted in from a nearby supernova. Others had proposed a photochemical effect called self-shielding, which this team has previously ruled out. The last-standing idea was that a physical chemical principle called symmetry could account for the observed patterns of oxygen isotopes. To test that idea, Chakraborty filled a hockey puck sized chamber with pure oxygen, varying amounts of pure hydrogen and a little black nugget of solid silicon monoxide. He used a laser to vaporize a plume of silicon monoxide gas into the mix. These are ingredients seen by radiotelescopes in instellar clouds, the starting point for our solar system. The silicon monoxide gas reacted with the oxygen and hydrogen to form silicon dioxide, a solid that settled as dust in the chamber and is the basis of silicate minerals like quartz that are so prevalent in the crust of the Earth. These reactions of gases formed the earliest solid materials in the solar system. When Chakraborty and Petia Yanchulova, a physics student and co-author of the paper, collected and analyzed the dust, they saw a mix of oxygen isotopes that matched the anomalous pattern found in stony meteorites. The degree of the anomaly scaled with the percentage of the atmosphere that was hydrogen, an observation that points to a reaction governed by symmetry. "No mattter what else happened early on in the nebula, this is the last step in making the first rocks from scratch," Thiemens said. "We've shown that you don't need a magic recipe to generate this oxygen anomaly. It's just a simple feature of physical chemistry." More information: "Mass-Independent Oxygen Isotopic Partitioning During Gas-Phase SiO2 Formation" Science, 2013. VENDItardE both a scholar and a new-age poet, all hail the wizard of prose. they are wrong its all Repulsive Neutrons, my left testicle never lies. No! Solar 16O enrichment is real and not the result of mass-independent fractionation (whatever that is). When the mass difference between 18O and 16O is twice as large as the difference between 17O and 16O (as in a 1 slope on the 3-isotope oxygen plot) complete mixing has occurred with NO FRACTIONATION, independent or otherwise. Alpha process nucleosynthesis enrichment occurred in a spiral-in stellar merger of our former binary Sun in a luminous red nova (LRN) at 4,567 Ma, enriching the Sun and LRN debris in alpha-process isotopes; 12C, 16O, 20Ne, 24Mg, 28Si, 32S, 36Ar, 40Ca, 44Ti, 48Cr, 52Fe, 56Ni and 60Zn and r-process radionuclides. CAIs condensed from high-velocity polar jets from the merger core with canonical r-process enrichments, while chondrules formed from melting of LRN dust clumps during the 3-million year flare-star phase of the Sun following the LRN.